The goal is to see if there are other ways of reaching out to people and getting them involved in developing a bus stop — or other initiatives. You can follow Next Stop Design on Twitter @nextstopdesign. No cure for FERS flu? What’s going on at the GSA Expo? Lisa Wolfe, the program director for Federal News Radio 1500 AM, was slated to be the moderator, but literally hours before the event, she lost her voice — she got laryngitis. So Wolfe asked me if I could step in… and I was honored to be a part of the program. We had a wide-ranging discussion — from cloud computing to leadership to the government hiring and workforce issues. Federal News Radio’s Jason Miller was there and he will be filing a report in the coming days. Over all — Wow! What a remarkable group of people — each one of them with unique skills. * Cloud computing: We had a good discussion about cloud computing and what it means for government. There still seems to be some question about what will be the ultimate driver of cloud computing. 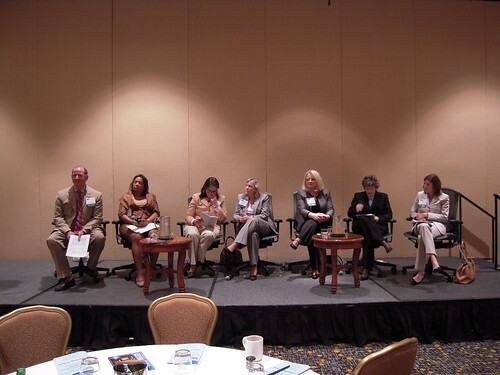 In general, most agencies are interested in the potential cost savings, but Moran noted that it also enables agencies to be much more agile There was a question from the audience about whether the government was going to set cloud standards so industry could know what to propose and build. Cureton pushed back suggesting that setting a cloud standard isn’t the point. The goal is to have a better tool that helps agencies carry out their missions, and that a federal standard — which would likely take… a long time — would delay that shift. There was much more, but… but I’ll have to see if there is time later. One quick aside: Turco mentioned that her father, who lives in California, had sent her a note asking about the WIT conference. Turco asked how he knew about it. Apparently he follows me on Twitter… and I had posted about it. Improving the government hiring process: I mentioned that on Federal News Radio 1500 AM’s Daily Debrief, we spoke to Steve Ander, who as of this month has graduated from Harvard’s Kennedy School, but… as part of his graduate program, he wrote a report on the government hiring process, From Brain Drain to Brain Gain. Hear our conversation with Ader here. Federal News Radio Book Club March “meeting”: What Would Google Do? 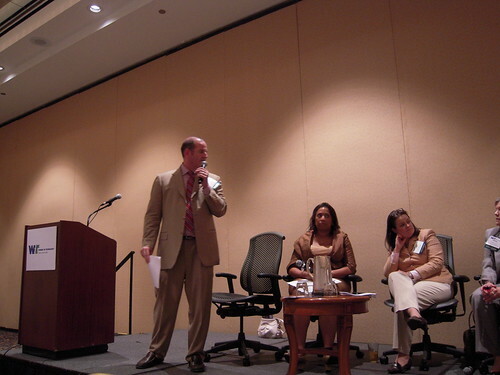 EPA’s Schlosser mentioned Jeremy Ames of the Environmental Protection Agency, who worked to get EPA to sponsor the creation of radon public service announcements. That, in turn, spurred the development of a radon social networking group — government as a platform. Read more here. If I promised other links, let me know and I’ll get them posted. We were saddened to learn of the sudden death of Christine A. Burman, the wife of Allan V. Burman, the president of Jefferson Solutions and the former administrator of the Office of Management and Budget’s Office of Federal Procurement Policy. Christine Burman passed away last Thursday and I just found out about it this morning. Allan Burman and his friends and family are certainly in our thoughts and prayers. It is just fascinating to watch what is happening in Iran. It is interesting with all the discussion about how the Obama campaign used so-called “new media,” but this is almost more… not real, but… more raw, maybe… it is fascinating to see how it is happening. And one of the remarkable examples is happening right before our eyes in Iran. TechPresident.com’s Nancy Scola has an excellent round-up of what people are doing — fascinating ways of supporting eDemocracy or whatever this will end up being. “By just about any measure, we’re seeing just an overwhelming amount of online information, direction, and action around Iran. Making any sense of it is a real challenge,” she writes… and somehow, one just has a sense that whatever the outcome, this is going to have ramifications. Twitter complied with the request, saying in a blog post on Monday that it put off the upgrade until late Tuesday afternoon — 1:30 a.m. Wednesday in Tehran — because its partners recognized “the role Twitter is currently playing as an important communication tool in Iran.” The network was working normally again by Tuesday evening. The State Department said its request did not amount to meddling. Mr. Cohen, they noted, did not contact Twitter until three days after the vote was held and well after the protests had begun. Meddling? To the contrary, it seems like very agile thinking on the part of Mr. Cohen. Q: What do you make of what’s going on in Iran right now. Shirky: I’m always a little reticent to draws lessons from things still unfolding, but it seems pretty clear that … this is it. The big one. This is the first revolution that has been catapulted onto a global stage and transformed by social media. I’ve been thinking a lot about the Chicago demonstrations of 1968 where they chanted “the whole world is watching.” Really, that wasn’t true then. But this time it’s true … and people throughout the world are not only listening but responding. They’re engaging with individual participants, they’re passing on their messages to their friends, and they’re even providing detailed instructions to enable web proxies allowing Internet access that the authorities can’t immediately censor. That kind of participation is really extraordinary. Back to State Department’s Cohen for a moment… I noted the New Yorker about his getting into Iran. That spurred a book, Children of Jihad: A Young American’s Travels Among the Youth of the Middle East. The book’s self-description: “Defying foreign government orders and interviewing terrorists face to face, a young American tours hostile lands to learn about Middle Eastern youth—and uncovers a subculture that defies every stereotype.” And yes, I did just download it onto my Kindle. You can read an excerpt of the book here. Meanwhile, we are working to get folks on Federal News Radio 1500 AM’s Daily Debrief with Chris Dorobek and Amy Morris this afternoon who can provide insight about what all of this means. It is still a work in progress, so… as we say in radio, stay tuned. 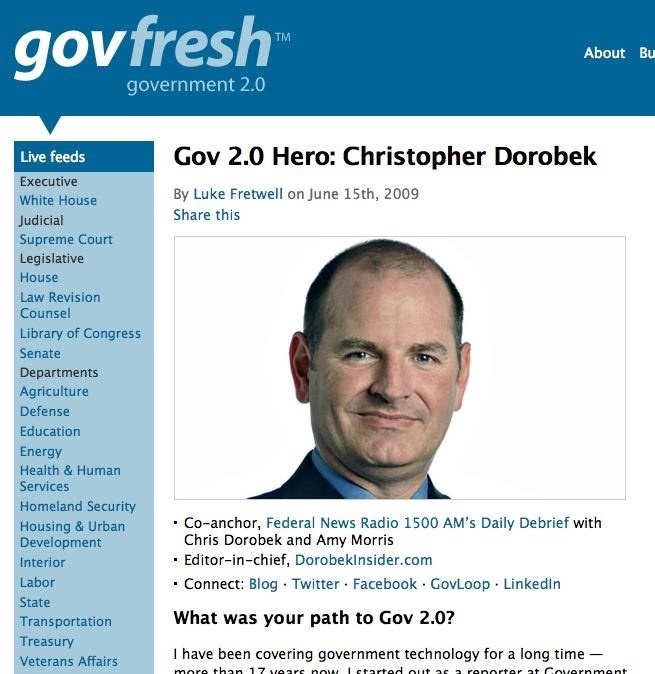 * What was your path to Gov 2.0? * What area of government offers the biggest opportunity for improvement via Web 2.0 tools? * What’s the killer app that will make Gov 2.0 the norm instead of the exception? * What part of Gov 2.0 most excites you? Our next meeting of the Federal News Radio Book Club is what we call a “get” — we will be talking about a book selected by Aneesh Chopra, the first ever federal chief technology officer, and Chopra will be with us for the discussion. Senior Partner & Managing Director of Boston Consulting Group’s innovation group will be joining us… so not a bad line-up: Chopra, Andrews and then Rose and Dorobek. Just a reminder in case you have not participated in a Federal News Radio Book Club “meeting” before: It is something akin to the Oprah book club except we talk about books that help feds do their jobs better. And perhaps unlike other book clubs, our “meetings” take place on the radio — specifically on on Federal News Radio 1500 AM’s In Depth with Francis Rose and online at FederalNewsRadio.com. And we’d love to hear your thoughts about these issues. Comments will soon be available here. I have also set up a Facebook event page for the book club. You can hear part two here. I started reading the book over the weekend and it is definitely a fascinating read. The book was written for the private sector, but… there is plenty in there that is applicable to government… and I know that Chopra will bring the pieces today. I’m a third of the way through the book. I’ll post some liner notes when I’m a bit further along. 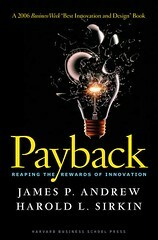 In the meantime, mark your calendar… Friday, July 17 at 2p ET for the Federal News Radio Book Club discussing Payback: Reaping the Rewards of Innovation by by James P. Andrew, Harold L. Sirkin, and John Butman.